The sponsor in Saudi Arabia must apply for a visa authorization through the Ministry of Foreign Affairs. Once the request is granted, the Ministry of Foreign Affairs will send the authorization directly to the Consular Section. The sponsor must provide the applicant with the authorization date, the number and copy of the visa slip. 1. Visa application form (Typed out or hand written in block letters). 2. A valid passport for 1 year at least from the application date including the place of birth (Original & one copy). 3. Three (3) recent passport size (4 cm x 6 cm) photographs stapled on the application formand the medical form. 4. 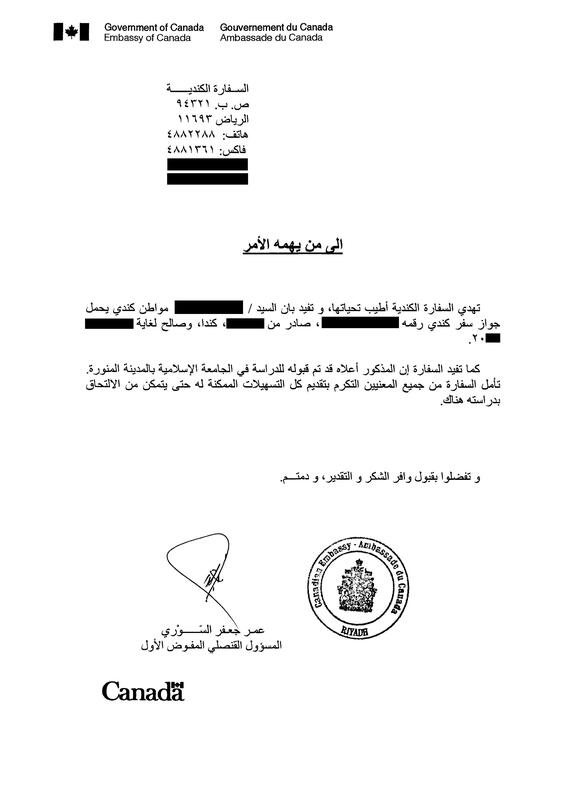 Letter of Sponsorship from the Saudi sponsor (university) certified by the university & indicating the authorization number & the date. 6. Medical report and attach all test results & have the report certified by the college of physicians of the issuing province (Original Only). You MUST confirm with your doctor that you have all required test results INCLUDING (HIV, Syphilis, Hepatitis B and C). 9. A photocopy confirmed airlines reservations must be submitted along with the application. 10. A statement or proof of religion.